Tuscookany at Torre del Tortufo Gets EVERYTHING right! 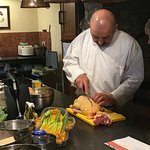 From the stunning location and Lena’s warm hospitality to the top-notch cooking lessons from the incomperable Franco, Tuscookany at Torre del Tortufo gets everything right. The villa is warm and inviting and every room is comfortable and offers beautiful views. The common areas for cooking and dining immediately provides a convivial atmosphere that brings together the guests who come together as strangers and leave as friends. Tuscookany knows how to create a community - good food, plentiful drinks and world class staff. To say that my traveling companions and I had high expectations for our trip is an understatement and our week at the Torre del Torfufa exceeded them in every way. I can’t say enough nice things about the staff. Lena provided excellent information before our arrival and was there making sure our stay at the villa was comfortable. She is the hostess who makes sure everyone feels like they are at home in their own beautiful villa (I wish). Franco has amazing teaching skills delivered with humor and simplicity. He has the patience of a saint as each session is “Franco! Is this right?” “Franco - what do we do next?” “Franco!” “Franco...Franco!” And Paola is the star who seems to be everywhere, fixing everything quietly and with delightful wry humor. The housekeeping team and gardner insured that every moment was bliss. 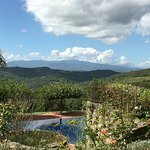 I find myself telling everyone who asks about my vacation that they MUST put it on...From the stunning location and Lena’s warm hospitality to the top-notch cooking lessons from the incomperable Franco, Tuscookany at Torre del Tortufo gets everything right. The villa is warm and inviting and every room is comfortable and offers beautiful views. The common areas for cooking and dining immediately provides a convivial atmosphere that brings together the guests who come together as strangers and leave as friends. Tuscookany knows how to create a community - good food, plentiful drinks and world class staff. To say that my traveling companions and I had high expectations for our trip is an understatement and our week at the Torre del Torfufa exceeded them in every way. I can’t say enough nice things about the staff. Lena provided excellent information before our arrival and was there making sure our stay at the villa was comfortable. She is the hostess who makes sure everyone feels like they are at home in their own beautiful villa (I wish). Franco has amazing teaching skills delivered with humor and simplicity. He has the patience of a saint as each session is “Franco! Is this right?” “Franco - what do we do next?” “Franco!” “Franco...Franco!” And Paola is the star who seems to be everywhere, fixing everything quietly and with delightful wry humor. The housekeeping team and gardner insured that every moment was bliss. Room tip: The views from the Torre rooms are excellent. Larger groups might enjoy the rooms that have their own sitting area and kitchenettes. 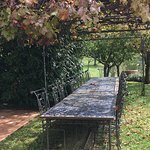 Magical is the perfect word to describe my experience at Torre del Tartufo. Lena was so wonderful assisting me with transportation and making sure my visit was stress free. Franco was an amazing instructor. Very attentive and patient as my fellow cooks learned their way around a kitchen and creating amazing dishes. His witty sense of humor made for fun days of cooking! I adored Paula. Quietly she moves around the kitchen keeping everything clean and orderly. She was always available to answer questions and give suggestions and I found myself wanting to clean my dinner plate just so she would give me a second dessert. I was blessed to have the most wonderful fellow guests. Our time in the kitchen was fun and working as a team became second nature. New friends were made and all made my experience that much richer. This experience was more than I ever thought it would be. The grounds are spectacular and every room has a lovely view. I started my day with a beautiful sunrise and ended the day with amazing sunsets. 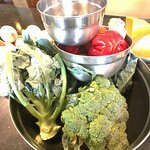 If you are looking for a vacation that combines beautiful accommodations, amazing people and the joys of learning cooking techniques, this is the perfect place to stay. Room tip: My room was in the Tower and very quiet. Hard to put words to the experience of this place; it is a stunningly beautiful location in the peaceful hills above Arezzo, made even more special by the antique-filled rooms, spotlessly cleaned and with special touches (like fresh flowers and sweet soaps)! You will want for absolutely nothing. Every single room has a view better than the next. The kitchen is extremely well-equipped, the perfect size for small groups that you will become great friends with over the course of your stay! You learn lots, you laugh lots; what really makes Tuscookany a little bit of paradise are the kind and energetic team who greets you, cares for you, works with you, encourages you, pampers you, listens to you and celebrates your culinary accomplishments: Franco, Lena, Paula, Alex and their hardworking colleagues. This is a five star holiday but if you can afford to put it on your bucket list, do. You'll never want to leave and always want to return. Room tip: Every room is great; special in its own way. I had a great time at tuscookany! I will definitely be back in the next year or two. Franco is great and very friendly. I loved to cook before arriving at torre de tartufo and this trip only solidified my love for cooking and food. The food is amazing and it's great to know that we made it ourselves! Our weather was very strange for early June--it was a little chilly and rainy but even so I had the time of my life! It took me a little while to finally write this review, but I was looking through some photos of the trip and decided I must write a great review at once! All in all, this is highly recommended and I love having the cookbook in my apartment. I've hosted some great dinner parties using the recipes. Will definitely be back at some point soon in the future. Amazing. I started my summer vacation in Ljubljana, hiking in Slovenia, and followed that with a road trip into Maribor, Budapest, Zadar, Trieste, a Tuscan villa, finally ending here. Though I fell in love with those parts of Slovenia and Hungary, and renewed my love for Croatia and Italy, I'll have to say that Tuscookany was a vacation of a lifetime. & I've marked a few life-times so far. But this just outdoes them all. As the villa started to appear through the road, I held my breath. Then I saw the villa, the pool, the gardens, and every little detail taken into making this an exceptional place. Hats off. Exceptional it really is. The pool was refreshing, but we also tried the hot tub two nights in a row and loved it. Then the cooking classes started. Franco & Paula smoothly navigating themselves around 6 rather clumsy students. Oh we messed up here and there, forget this step or that, overcooked this and dried the other, but the end result was perfect. Every single time. & the dynamics in the kitchen were wonderful (mind you, that was often 3-7 hard labor). And when Lena is in the house, you can rest assured there will be one amazing cake/cookie for breakfast after the other. Ask her for the almond cookies. So delicious and addictive. Everything was exceptional: the class, the fresh ingredients we used in our cooking, the pool, dining areas, etc. All amazing. If you're not used to Italian/mountain roads, you might think the drive intimidating. But once you arrive, you realize it was just a mountain road, beautiful to experience on its own. I can not wait to return! This vacation far exceeded my expectations! The cooking lessons were incredible, the staff was fabulous and friendly and so accommodating and helpful and friendly. The grounds were impeccable and a beautiful surprise with every turn. I'm already planning my next trip!